Ceramic Owners... Are you happy? I've got the base model S10+ in Prism White. The wife wants one, so I'm thinking about going up to the 1TB / 12GB ceramic and giving her mine. Is everyone happy with it? Would you have made a different decision if you could do it again? Anything you really like / dislike about the ceramic build now that you've had some time with it? I love mine. Got the Ceramic black. It is not a true black, but has more a brownish hue to it, but it looks really nice. Also better knowing it is more resistant to scratches. Feels like a well built phone in your hands. I love the ceramic but I have no need for 1TB of storage. I imagine most people that go that route will never fill it up. I also don't see an advantage to 12GB of memory. I went with 512 because I got it for the same price as the 128. I have no regrets and will probably never fill it past half way but I can always add an SD card. It's your money and if you think you'll get your money's worth with the 1TB don't last my thoughts stop you. I have the ceramic black and am happy. I had the normal S10 too (which I returned) and IMO the ceramic just feels more substantial in the hand, heavier but in a good way. It is just opinion but the glass S10 is very well built but I found the lack of weigh a little disconcerting, others will prefer a lighter phone so YMMV. P.S You do not have to get the 1TB version to get ceramic the 512gb version also has the option. Congrats to all who own one. I considered it but decided that cost/value benefit wasn't the best for my situation, not to mention the resale value. I feel I have made the right decision in buying my ceramic white 1TB S10+. I wanted the 12GB RAM more then anything and so far in the two full days that I've used my phone, I've seen the benefits of the extra RAM, especially in scrolling through long search pages of images in instagram. It's just so smooth and this phone has just been that way through everything I've done on it. I wish my iPhone XS Max was this smooth in doing the same things I mentioned above, it's not. Eggmundo, libra89 and Morty2264 like this. 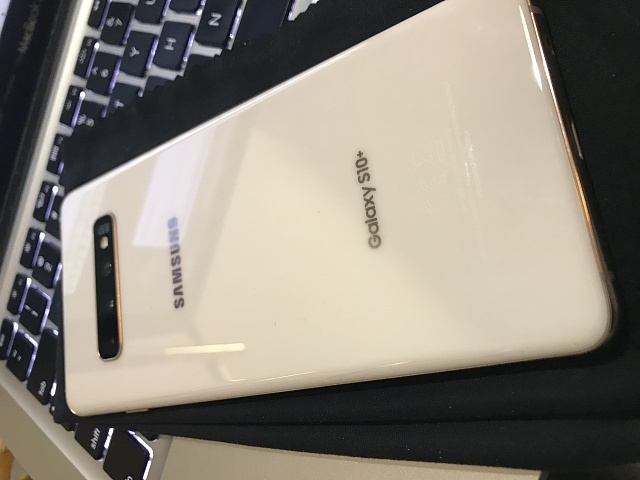 I love this ceramic white S10+. I would definitely recommend it. The s10+ is just a very smooth phone. 12GB RAM? Even more so I'd imagine. The 512GB model doesn't have the 12GB RAM. Really like the added weight of the ceramic version, very happy with mine so far. Gorgeous phone. I normally like to go for the best but 12GB of RAM? Monstrous. I like it...but 8GB will do for me...for now. I'd love to see how the OS uses 12GB. Interesting. I guess I only viewed the added weight as a negative. Never thought to look at it as a positive. I just picked up my wife's current iPhone XS Max and at 208 grams (a little more than the ceramic S10) it feels different for sure. I'm assuming it has a more premium feel than the glass version. Your 8GB is already way more than adequate. The extra RAM will only hold more apps in memory without having to reload them. 12GB will not run smoother or faster. Quantity of RAM does does not increase speed at all unless we use faster RAM. The only time RAM impacts speed is if we go well below what is needed to operate in which case we have a bottleneck. The real answer to speed is faster processing. The downside to too much RAM is that it is always on whether it is being utilized, so effectively it will drain your battery faster. Xxtoxicskittlexx, Eggmundo and dtones39 like this. I've read that before, so the extra RAM may be useful when there's a bigger OS that needs it or if you just tend to load a huge plethora of apps. Now, they should have made the battery another 100-200mah bigger on the 12GB model just to put a cherry on top but I imagine perhaps not too too many 1TB models are moving for it to make business sense. Most would not notice the additional drain unless they somehow measured it. Yea, I think the 12GB ram is more fun to have than it is actually practical. One thing for sure is you don't have to worry about optimization of your memory or killing apps all the time. I was getting the 1TB because I do a lot of 4K video. Without a doubt the primary reason to get that model is the 1TB storage. I only store hi-res audio files so 512 will hold me and I can always add my SD card. Amen. No phone needs 12GB of RAM. Yeah but we need bragging rights. Bragging rights are kinda important. Knew I should have got the 1TB/12GB model. felloffthetruck, EricMartinSoCal, DMP89145 and 1 others like this. Maybe it's not too late to make another exchange? Bragging rights??? No, I don't buy phones for that. Lol. I'm really liking my black ceramic S10+. It makes for a really beautiful device. The only negative is it is the biggest fingerprint magnet of any device I've had. You're using it without a case I presume. I'm not that brave. How much you think AOD effects battery life? Trying to record quiet audio and Samsung S10+ keep notifying me by vibrate that sounds are too low!